Filings are a preliminary patent application activity indicating the potential interest of innovating businesses from all over the world in the European technology market. In 2015, European patent filings grew again (+1,6%) reaching a new high of nearly 279 000. Statistics are based on the first-named applicant. Figures are based on data from the EPO and WIPO (for PCT filings) as available on 26/01/2016. The PCT filings for 2015 are therefore estimates. The share of international filings under the Patent Cooperation Treaty (PCT) has increased significantly over the past five years. 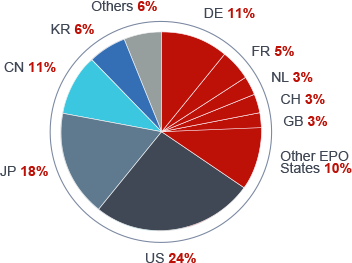 In 2015, total filings at the EPO included close to 62 000 direct European filings under the European Patent Convention and around 217 000 international filings under the PCT. Roughly a third of the total filings in 2015 came from the EPO member states and two-thirds from outside Europe. The top five countries were again the US, Japan, Germany, China and South Korea.